I was going through my cabinets recently, clearing out the old stuff and I came across a can of French's French Fried Onions that I had bought to make their green bean casserole for Easter. Well I obviously didn't make the casserole so I took it out and set it on the counter to figure out what I wanted to do with it. 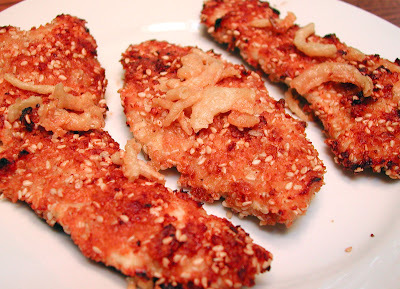 That same day on the food channel, Rachel Ray was making chicken fingers with sesame seeds and dehydrated onion. Perfect! I decided to concoct my own recipe by combining some of her suggestions and some of French's recipe. It turned out pretty darn good! Place chicken and buttermilk in a bowl and let stand for 30 minutes to an hour. Place French Fried Onions into plastic bag. Lightly crush with hands or with rolling pin. Add the sesame seeds and cheese and mix well to combine. Remove each chicken piece from buttermilk letting the excess run off and coat with onion crumb mixture, pressing firmly to adhere. Place chicken on baking sheet lined with foil and sprayed with cooking spray. Bake at 400°F for 15 minutes or until no longer pink in center. Sprinkle with additional crumbs, if desired. I've done this before, and it turns out really well. Those crunchy onions are great for salads, and topping baked savory dishes, too. Like mac n' cheese. Emilie, the mac n' cheese is a great idea- I may just use my leftover onions the next time I make it!! thanks for the idea! Those french fried onions are evilly delicious. The Last Hurrah to Summer!